International Women’s Day: Women fuel economic growth & plug digital skills gap – so why are we 100 years away from equal pay? Analysis: Progress towards workplace equality is moving at a glacial pace – especially in the tech sector. A lot can change in 100 years. In the last 100 years we have seen women win the right to vote, the first female Prime Minister and the legal establishment of statutory maternity pay, among others. On the other hand, not an awful lot can change in 100 years. The World Economic Forum believes that it will take until 2133 for women to achieve equal pay. The IT and technology industry, in particular, is one sector where this glacial pace of progress regarding workplace diversity and equality is ever prevalent. Deloitte Global predict that by end-2016 fewer than 25% of IT jobs in developed countries will be held by women, while around 18% of IT roles in the UK are held by women. "For me International Women’s Day is important on two levels – first as a chance to take stock of what women have achieved and to celebrate our contributions. For example, at Salesforce, as we always do on International Women’s Day, we’re holding celebrations, networking sessions and informative panels for our teams across the European region in honour of all our female employees. "Second, IWD is also a great way of driving awareness of the issues. It’s definitely not the only point in time we remember them, but it’s a fantastic reminder for men as well as women – after all, gender quality is something we all reap the benefits of." There is no denying that workplace equality and more women in tech will benefit society on a moral and social level, but greater gender parity will also drive UK economic growth. There are currently 762 women-led companies in the UK with revenues between £1m and £250m, with these companies expanding at a median growth rate of 30% a year. 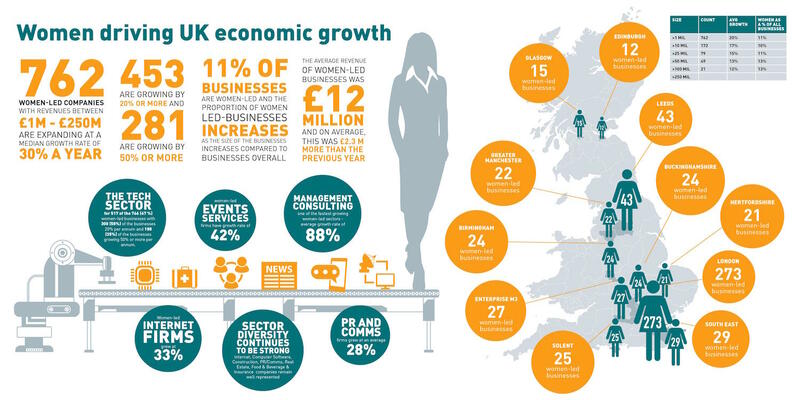 The average revenue of women-led business in the UK was £12m on average, £2.3m more than the previous year. "The digital skills gap is already posing a massive challenge to businesses across the UK, with over 90 percent of technology companies already stating the digital skills gap has a direct negative impact on their business. Unfilled roles requiring digital skills are already haemorrhaging a potential £2bn from the economy, and this problem will only be exacerbated as the 134,000 new jobs are created in the tech sector every year remain vacant. "Women currently make up a very small percentage of the STEM workforce, and therefore present massive potential for plugging this skills gap. And for individual businesses, a stronger female workforce will help them avoid expensive overseas recruitment programmes to fill positions. "It’s also been demonstrated that women make a positive impact to a business’ bottom line. A McKinsey whitepaper on gender equality in the French multinational firm Sodexo analysed the data from 50,000 managers across 90 entities worldwide, and found that teams with a male-female ratio between 40 and 60 percent produced more predictable and sustained results than those of unbalanced teams." Eileen O’Mara echoed the sentiments of de Rojas regarding the digital skills gap, but also highlighted the different skill sets which women can bring to the workplace and business. "The benefits to UK Plc of having more women in the tech industry are truly enormous. Not only do women bring fresh perspectives to the workplace, they are also proven to generally be very good problem solvers and communicators – both key skills for jobs in technology. What’s more research indicates that companies with women on the board make better decisions. "According to Belinda Parmar tech companies with women on their management teams have a 34 percent higher return on investment. Perhaps even more pressing is the fact that we’re still in the midst of a skills shortage: according to the EU, we’ve already passed the 900,000 IT-related job vacancy mark. By encouraging women to enter or return to the tech industry at all levels, we can help address that gap, making the industry more competitive, more innovative and a greater contributor to GDP. Identifying the benefits of more women in the IT and tech sectors are, perhaps, easier to articulate than identifying why there is a lack of women in the industry. There are two issues sitting at the core as to why there is a palty 18% of women in the UK IT industry. Firstly, there is the issue of getting women in the door – getting young girls interested in STEM and getting them on their way to a career in tech. Secondly, there is the issue of keeping women in tech – breaking the glass ceiling and getting more women into leadership positions and onto the board. The first issue is a major challenge threatening the industry and serving to only fuel the digital skills gap. According to recent Accenture research, 47% of young girls believe that boys are better matched to STEM subjects, with a further 60% thinking that maths and science are too hard to learn. This perception of STEM matched Eileen O’Mara’s childhood experience, with O’Mara telling CBR: "Growing up, no-one suggested a career in technology to me and I had very little exposure to computing – it just wasn’t considered a girls’ thing. "While we’ve made great strides in encouraging girls into STEM careers, stereotypes are hard to break down and many girls still think of it as a career for boys who are exceptionally good at maths – when in reality that isn’t the case at all." Sarah Shields, executive director and general manager at Dell UK, had a similar experience at school, while again highlighting the struggle in getting girls to choose STEM: "The challenge we have is to get girls to make that choice at school. If you ask most women in their 30s and 40s whether the careers advisor talked to them about a career in tech, the answer would most likely be no. "For instance, I was given a sheet of paper with a list of cashier jobs at Tesco. When I said I saw myself managing the company rather than the till, I was put in detention for answering back." Getting girls interested in STEM is a complex issue requiring parent, government and industry to combine resources and knowledge in order to spark passion and interest in STEM. Recent events such as the Accenture Girls in STEM day and the TechFuture Girls clubs run by HPE and the Tech Partnership are good examples of industry and education coming together to drive interest in STEM. "Firstly, we must ensure that women are viewed as equals in the workplace and are being promoted based on performance. There remains a toxic combination of unequal opportunity and unequal pay, which contributes to the glass ceiling that many in our industry face. "Secondly, it is important for women in senior positions to ‘send the elevator back down’ to help the next generation of digital entrepreneurs surpass the current generation’s achievements. "Thirdly, we need to get more women into technology to begin with – because as we see an increase in the number of women entering this sector, the underrepresentation of women on the boards will be starkly noted. Women remain a largely untapped resource across all STEM sectors, representing a paltry 15 percent of its entire workforce despite accounting for 47 percent of the wider British labour market. "And finally, culture trumps strategy every time, so unless we change our cultural norms which make it uncomfortable for women to survive inside male dominated norms, we will never move the needle." Having outlined the business benefits of workplace diversity and highlighting the two key issues holding back women in tech, the minefield of challenges facing UK businesses are vast. Many businesses have diversity programs, policies dictating procurement and equality targets – but, as Regina Moran, Fujitsu UK&I CEO, tells CBR, businesses must not approach diversity as a box ticking HR requirement. "Businesses should approach diversity not as a HR-driven requirement, but as a fundamental business strength. The long term success of any organisation, particularly in fast-moving fields like technology, depends on access to a diverse workforce that provides fresh perspectives, ideas and values. It is also very much about inclusion. Moreover, women represent a large proportion of consumers, both in the workplace and at home. If businesses want to continue to meet consumer demands, they must represent and understand their target audience. "In terms of strategy, the first step in addressing the low number of women is to increase the pipeline of talent by driving recruitment of women at a graduate and apprentice level. These women must be retained within businesses, through the provision of flexible working to support women throughout their career lifecycle. Women’s networks are also vital in ensuring that women receive pastoral support and advice. The senior team must take the lead by championing women within their organisation, with senior women acting as mentors and role models. With this approach, in ten years’, time the disparity is likely have begun to close." There is still a long way to go where women in the workplace are concerned – here’s hoping we can can achieve gender parity in less than 100 years time. It is worth noting, however, that although there is still much to be done, progress has been made. There is, according to WEF’s Global Gender Gap report, nearly a quarter of a billion more women in the global workforce today than a decade ago. Although highlighting the fact that women are still outnumbered in meetings, Dell’s Sarah Shields told CBR: "Having been in tech for 20 years, a lot has changed. I’m seeing more women at my level across the industry and I’m seeing more women entering the workforce. There is definitely more support and more recognition of the problem but unfortunately, it still isn’t enough." Hopefully with days like today, these issues can enter mainstream discourse and fuel progress – for not just women, but for men, society and economy. "We have the opportunity to become a digital nation of significance; a magnet for talent and investment." Jacqueline de Rojas told CBR. "Sadly in the technology industry we are struggling to find enough talent and by 2020 we may even face a skills desert as the pace of technology dependence continues. "By including women we increase our chances of economic growth and better run businesses. International women’s day shines a light on this future and serves as a stark reminder to create a cultural shift towards the inclusion of women in the workforce."